"Let them give me a car and I'll have the 16th, otherwise what's the point of having more," says Emma, a mother of 15 children who moved from Ashtarak with her family and resided in Azerbajian's (formerly called) Lachin region in 1997. The village, Pirjahan, was renamed as Goghtanik and the region is now called Kashatagh, and became the sixth region of Karabakh (the fifth region located on the north of Lachin is former Azerbaijani Kialbajar region that was renamed as Shahumian). "So, I decided to have seven more children for my father's sake. And I became a father of 14 children. And the 15th child was born in honor of Karabakh." Emma's 15th child, Artsakh, was born in 1998 in Kashatagh's hospital. Emma and Sergey have six grandchildren. Their three daughters are married, two of them live in Ashtarak and third daughter lives in the neighboring village. Emma and Sergey and their large family are part of a project carried out by the Armenian government to resettle Lachin and in doing so merge Armenia with Karabakh. "Our living conditions were very difficult. I was working in Ashtarak's Institute of Radiophysics. The work had been stopped. Then I started to work in college. But there was no money there. Later Anahit persuaded me to come here," says Sergey. Anahit Danielyan was head of Goghtanik village and thanks to her there are many of her former acquaintances from Ashtarak now living in the village. However, like in other villages of Kashatagh, there are many residents from different regions of Armenia living in the village. 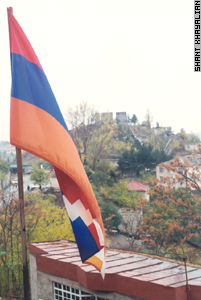 And despite the region is one of administrative areas of Karabakh, there are almost no Karabakhis living there. Kashatagh region was created in December 1993 and started to be populated. With the assistance of administration residents built new houses on the roofless walls left in Azerbaijani villages. 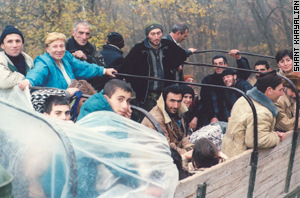 In 1992, when Armenian military troops conquered the region, there was a military order that villages should be burned, so that they would be uninhabitable for Azeris who might try to return. A year later the resettlement program began. At present there are about 130 villages, with 50 schools, a criterion for establishing residences. New residents are attracted to the region by government privileges that pay each family 20,000 drams (about $40) plus 5,000 drams (about $10) for each family member and 120,000 drams (about $240) for cattle credit over a 20-year period. Each family also gets 200 kilowatts of free electricity. Water is free, and there is no tax on agriculture. "We don't receive everybody," says head of Resettlement Department of Kashatagh's administration Robert Matevosyan, "as sometimes it happens when people come, get an aid and then disappear. They aren't lazy to come here from Yerevan to get those 20,000 Drams (travel expenses are free for the new residents). We talk much with them and only after that we find out that they come here for getting permanent residence." Due to a lack of finances, the cattle credit has a two-year delay. There are some residents, however, who have been waiting for the credit since 1999. During his second year in the village Sergey was given cattle credits and purchased two cows. They bred and in three years their number increased to five. He also has 10 sheep. He works in Berdzor (former Lachin city) in Capital Construction Department as carpenter-woodman, where he makes 35,000 drams (about $70). He also gets 15,000 drams of allowance for children. His wife is working as a cleaning woman in Goghtanik's school, his son Gurgen is a watchman and he earns 6,000 Drams. The government of Karabakh still owes the family a car - as families with many children are entitled to a free car. "In the beginning we were very pitiful," Emma says. "We had nothing. But when we got cattle credit our living conditions improved a little. We had just been resuming our natural course. But still it hard enough, it's not easy to raise 15 children. Seven of them are studying in school. If only they helped us with stationery. Agape helps us with clothes but that's not the thing." Agape is the only international organization that is functioning in the resettled territory, as the world community regards that territory as occupied, and its re-settlers as colonizers. Diplomats regard the 3000-square kilometer corridor as occupied territory, but Kashatagh's officials regard it as liberated territory and they rename the settlements, either restoring their historical names or giving other Armenian names. For the re-settlers Kashatagh is an escape from Armenia with the difference being that here they don't become refugees but landowners. And it is only the officials who talk about the re-settlement as a patriotic action. For the new residents it is simply an opportunity to improve their living conditions. "If I say that I've come here to be a hero it won't be true," says director of Goghtanik village's school Alik Tonoyan, who came from Baghramyan region's Dalarik village, "my family consisting of seven people was hungry. Me and my wife were teachers in school but we hadn't got enough money for bread. And now I help my parents from here. "In ten days I'll sell my pig and will earn $150. Every year I earn 300,000 Drams from potatoes. In Yerevan we used to pay for apples and pears and here it's for free you can just pick and eat. Here, nature gives and working people take. The heroism was when guys took these territories. And now, who knows, maybe in this house where I walk, the blood of an Armenian man was shed. And now it is my land, my family is here and if war begins I will fight. I know the place of my military unit." 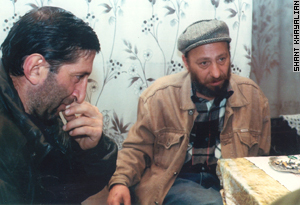 In the village there is the biggest water-supply in Alik's house, where Azeri tractor driver Ali Mohammed, whose Communist Party card was found in the storeroom, lived before. Keeping an ample supply of water is symbolic for Alik, as in the village where he previously he had to pay 30 drams for a bucket of water. The 38 kilometers of dirt roads from Berdzor to Goghtanik village, which was founded in 1995, is located on the slope of one of the three gorges stretching to the north. When the village school was first opened there were only seven pupils. Now there are 30. Villagers remember the day, when first child was born six years ago. That child's umbilical cord was cut by the mother. The latest child was born in May of 2001. For the present moment there are 22 families (84 people) in the village. An abandoned Azerbaijani cemetery is at one of the village's edges and at another edge there is an Armenian graveyard, where there are already four graves. Robert Matevosyan recalls that five or six years ago he took bread with him, when he went to village, to give it to half-starved villagers. Now villagers can feed about 10 people and send them off satisfied. Villagers tell that several years ago people used to go to Goris from Goghtanik for buying necessary foodstuff. It was impossible to buy bread even in Berdzor. Now there is a shop in the village, where one can buy the most necessary items, vodka and cigarettes. Different dialects of Armenian language are mixed in Goghtanik, where people from different regions of Armenia are gathered, from Sisian, Echmiadsin, Ashtarak, Eghegnadzor and Yerevan. 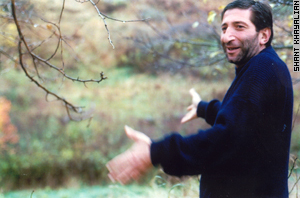 "A new type of Armenians is shaping," says the latest re-settler of the village Hrach Beyleryan, who came from Yerevan two months ago with his wife Hasmik to reside here. "It would be great if we built a chapel here to rally villagers. Because now only vodka rallies people." His two sons are serving in the army. They were jobless in Yerevan and thanks to his wife's persuasion they came here to be able to live. 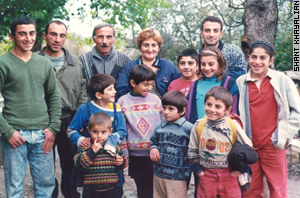 "We were in such a condition that we had to sell our house and leave Armenia. It had already been impossible to live," says Hasmik. "Now we feel that everything will be fine. We have work and we will get cattle credit. Next year there will be a harvest." They were given a common single-room house, which is decorated with canvases hanging on walls and a library brought from Yerevan. The struggle with discomforts of their house is an opportunity to fill Hrach's everyday life with work. "If I said that I was going to leave for Baden-Baden he wouldn't sleep at night," says Hrach, 50. "I was sick and tired of Yerevan. I was a translator and I hadn't got money for months. I'd been cursing officials until I became 50. After 50 I will devote myself to teaching. Now I've realized that I'm more satisfied when I teach a kid something." A lamb I am driven to the pasture of "Homeland"
And the grass is loathsome, but where else could I go? So as not to cling to the wall and dry up. "That fly is me when I was looking for warmth," Hrach says. "I came here to find that warmth."